One of the most common and useful medical diagnostic procedures is radiography or x-rays. The term x-rays originates from 1895 when the German physicist Wilhelm Röntgen discovered the technique. Since he was unsure what exactly was producing the image on his plates, he titled his paper "On a New Kind of Rays" and the term "x"-rays was substituted for "unknown rays." The term radiography refers to the use of electromagnetic radiation to produce a visual image on a medium such as a photographic plate. "Both x-rays and visible light rays are forms of electromagnetic energy..."
The greatest benefit of x-rays is their ability to penetrate tissues and show internal structures. Both x-rays and visible light rays are forms of electromagnetic energy carried in waves by photons. The difference between visible light and x-rays is the amount of energy in the individual photons. X-rays have higher energy and a shorter wavelength than visible light. is the energy produced by an x-ray beam is absorbed by many hard materials or by mineralized tissues in the body such as bones and teeth. Soft tissues such as the liver and kidneys absorb some x-rays, while air does not absorb any x-rays. Lead will completely absorb all x-rays. 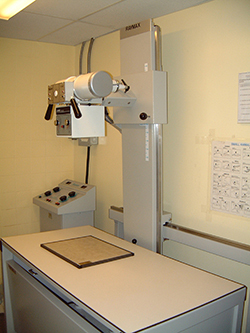 An x-ray machine produces a narrow beam of x-ray photons that can be aimed at a particular object. A special receptor such as an x-ray cassette is placed beneath the object to "catch" any x-rays that pass through it. Areas that absorbed the x-ray photons will be white or unchanged while areas that allowed the photons to pass through will turn black. In the case of your dog's leg, the x-rays will be almost fully absorbed by the bones, while the muscles and ligaments will absorb varying amounts of x-rays. The resulting image will be one of white bones, black air surrounding the leg and various shades of gray representing the muscles, tendons and ligaments. Areas that contain fluid or air will not absorb much, if any, of the x-ray photons and will appear black or dark gray on the image. Digital and computer radiography work in a similar fashion. Images produced by these forms of technology can be enhanced or manipulated with ease and there are no environmental contaminants used to develop the x-ray film. X-rays can be potentially harmful and for that reason, you are not allowed to be present with your dog during the procedure. Radiology personnel wear special protective lead gowns and shields and your pet will have protective covers placed over the parts of the body that are not being radiographed. What can be seen with an x-ray? "X-rays are most useful for viewing areas of the body that have contrasting tissue densities..."
X-rays are most useful for viewing areas of the body that have contrasting tissue densities and when viewing solid tissues. In the chest, the lungs are primarily filled with air and have a very soft density, so absorb very few x-rays. The heart muscle is denser, while the bony ribs are hard and extremely dense. The heart silhouette is easily seen on an x-ray, and large blood vessels can be seen within the lungs since the blood and arterial and venous walls are denser than the surrounding lungs. If fluid accumulates in the lungs (pulmonary edema), it is also readily seen. In the abdomen, many organs can be distinguished and foreign bodies or air trapped within the intestines may often be easily observed. 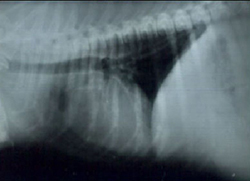 The size and shape of the liver, kidneys and spleen are often assessed on radiographs. In animals that are extremely obese or that have very little body fat, it can be more difficult to distinguish the various internal organs. Areas that cannot be properly seen on x-ray include inside the skull, because bones of the cranium absorb all of the x-rays preventing viewing of the brain tissue. Details of internal structures such as the inner structure of the heart, the bladder or other abdominal organs, many joints and the lungs are better viewed with computed tomography (CT), magnetic resonance imaging (MRI) or ultrasound (US). A skilled veterinarian and veterinary radiologist can determine many conditions with the use of this relatively simple and inexpensive diagnostic tool.